I miss it. Flying seems to be the perfect breeding ground for nostalgia – remembering waking up to watch the sun rise over Paris from your tiny oval window, kissing your boyfriend goodbye for the hundredth time as the taxis whiz past, stepping down onto the tarmac and being overwhelmed by the thick, humid air of some magical tropical place. During my flight back to Durham on Monday night that nostalgia took the form of a remembered vision of snow-covered spires receding out the window as I headed back to the States, melancholy at leaving my temporary home, but bubbling with the excitement of seeing Trevor and my family again. It’s been exactly 3 months since I got back, and even though spring is jumping all over North Carolina, I think I’m allowed to dedicate a little space to the cold and beautiful city that was so good to me. Most of all, I miss the trams, and I miss the details of my morning commute. Walking briskly around the block to the tram stop, head tucked against the cold. Waiting quietly with the other Czechs for the shiny red number 12 to pull up, then climbing in and sitting in the warm compartment, always slightly or more than slightly odorous from so many bodies. Snaking along the river while looking out the glass and across to the city, watching the spires and the cupolas slowly shift as we moved past. 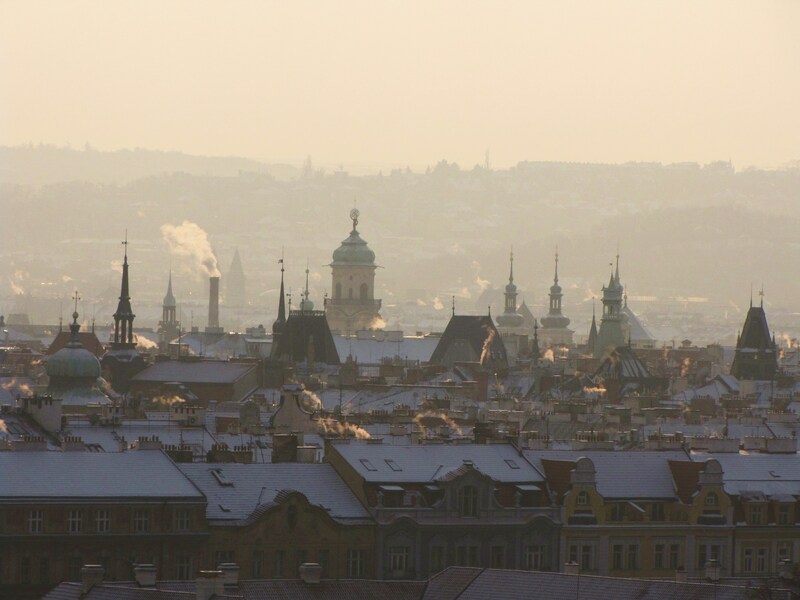 And then getting off the tram, stepping back into the brisk air, walking across the bridge each morning and looking out towards the Charles Bridge. Every day the skyline is the same, the same as it has been for centuries, and yet it feels different and new and wonderful. Then, suddenly, you’re in the heart of the city, trying to cross the street in the fleeting three seconds that the light is with you, avoiding trams and buses and cars and horse-drawn carriages all at once. The smooth-walled buildings tower over the narrow, cobbled streets, busy with tourists headed into Old Town Square, but if you enter the grocery store just before the square you’ll find yourself in line with 20 other Czechs, picking up their fresh spinach pastries. A few more blocks, warm, flaky pastry in hand, and you’re in Malé Nàměstí , stepping into the centuries old building where you go to school. I’m not sure how anything as simple as going to school could be more exhilarating. Melt butter in dutch oven over medium-high heat. Sautee onions in butter until beginning to soften. 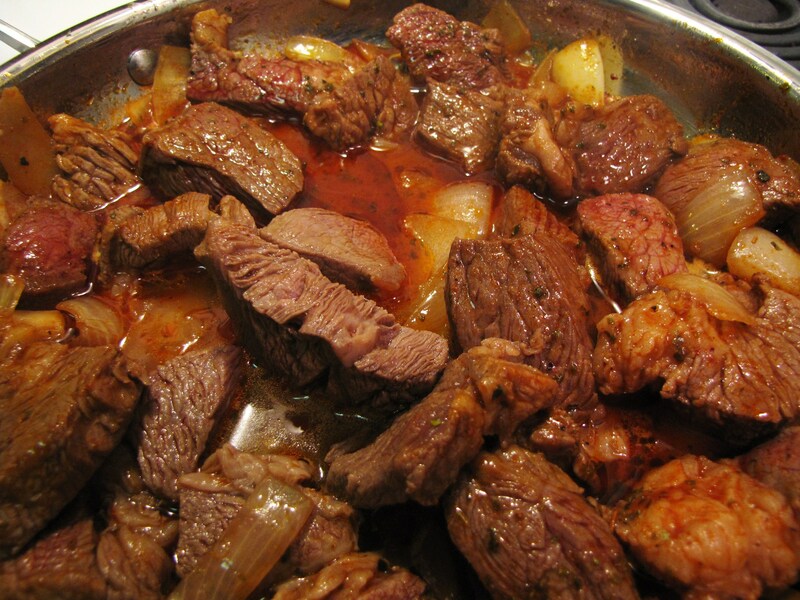 Add beef and paprika to butter and onions, brown beef on all sides. Add marjoram, coriander, black pepper and garlic, and stir well. Add water and reduce heat to a simmer. Cover and cook until meat is tender, 10-15 minutes. Check meat for doneness. Uncover and allow sauce to reduce to desired amount. Add flour 1 tablespoon at a time and stir, allowing sauce to thicken before adding more flour. Stop adding when sauce reaches desired consistency. Season with salt. 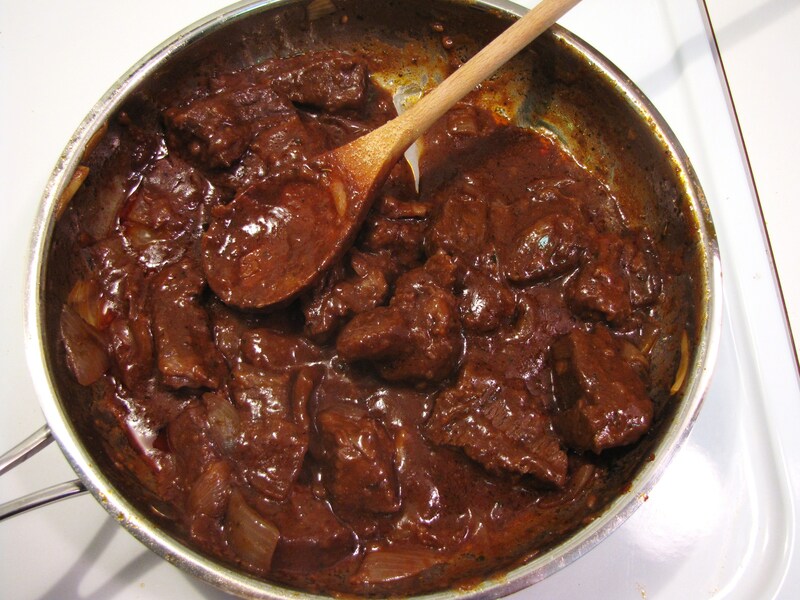 Do this after sauce has reduced to avoid over-salting. Goulash is usually served with bread dumplings, not potatoes, as the airy bread slices soak up the sauce very well. Any light bread will do. It is also sometimes served with pickled red cabbage…. two recipes I’ll be looking into! Dobrou chut! KATIE! I’ve just stumbled upon this blog, and just had to comment on this post. 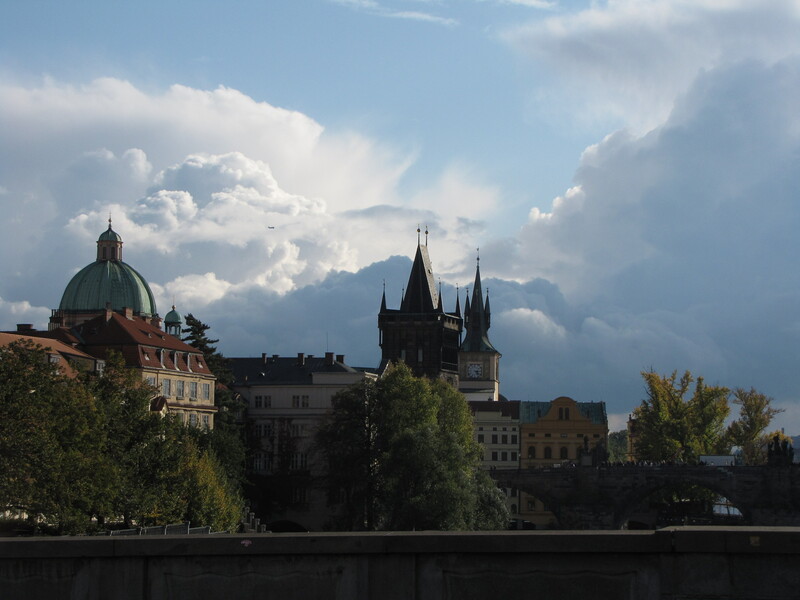 Because reading it made me miss Prague so much! It was nice to think back to our morning commutes, the walk across that bridge, and everything else. -sigh- miss it so much. Hope you’re well (and fully recovered from LDOC.. HAHAHA) and get yourself to NYC this summer!!! It is 5th pad, therefore, the correct word would be PRAHO. Miluji the, PRAHO. Beautifully written, made me homesick.